Valley Cottage, United States - January 10, 2019 /MarketersMedia/ — Future Market Insights delivers vital insights on the inkjet printer market in its published report, titled “Inkjet Printers Market: Global Industry Analysis (2013-2017) and Opportunity Assessment (2018-2028)”. 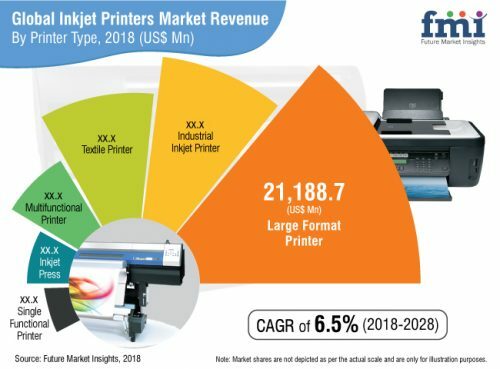 In terms of revenue, the global inkjet printers market is projected to expand at a CAGR of 6.5% during the forecast period, owing to numerous factors, about which FMI offers thorough insights and forecasts in this report. Inkjet printers are non-contact printers which use a nozzle to propel the ink on the substrate. The nozzle of inkjet printers is controlled digitally. Different inkjet printers are used according to the various applications. Single and multifunctional inkjet printers are used in institutions like offices, schools, and colleges. Large format inkjet printers are used to print posters, photographs. Industrial inkjet printers are used for marking, coding, and printing labels generally for packaging. While inkjet press is used for bulk printing such as books, catalogues, and magazines. In the report, FMI suggests that multi-functional and large format inkjet printers segments are expected to play a critical role in the growth in demand for inkjet printers during the forecast period. Inkjet printers due to lower investment cost and high print quality are expected to witness an increase in preference over counterparts such as laser printers which are used in many emerging countries. The APEJ is expected to spearhead the global growth in the inkjet printers market. The presence of radially emerging economies, increasing living standards, and the large urban population are expected to be the critical drivers for the growth of inkjet printers market in the region. According to FMI, multifunctional inkjet printers are expected to have the largest market share in the inkjet printers market in the region due to the versatility of the multifunctional inkjet printers and increased penetration of multifunctional inkjet printers in offices, schools, colleges, and other institutes. China is expected to outpace the other countries in growth of inkjet printers market in the APEJ. North America and Western Europe are projected to witness stagnant growth due to the maturity of the inkjet printers market in the regions. The US in North America and Germany in Western Europe are expected to have the largest market share because of the higher preference of the consumers for inkjet printers over other printers. However, the large format inkjet printers are estimated to have maximum growth in the region due to the increasing trend of adopting large format printers for the poster printing in advertisement and the professional photo printing. Latin America and MEA are expected to be the promising markets in the global inkjet printers. The emerging economies in North Africa and Latin America, specifically Argentina and Mexico, are expected to represent high incremental opportunities due to increased penetration of inkjet printers into end-user industries. The paper segment, by substrate type segmentation of inkjet printers market, is expected to have the highest share in the inkjet printers market of Latin America and MEA due to the higher consumption of copier papers in the regions. Japan accounts for a smaller share in the global inkjet printers market. However, Japan-based companies such as Seiko Epson Corporation, Canon Inc., and Brother Industries Ltd combine to have the highest market share in the global inkjet printers market. The companies involved in inkjet printers manufacturing have their key focus on enhancing the ink carrying capacity of the inkjet printers and to increase the global footprint through acquisitions and expansions. The manufacturers of inkjet printers are likely to eye the profitable region of Asia Pacific in the coming years. Mass urbanization in these countries, coupled with improved standards of living, is expected to be the key driving force behind growth in demand for inkjet printers. Key players considered in the report on inkjet printers market include HP Inc., Canon Inc., Brother Industries, Ltd., Seiko Epson Corporation, Xerox Corporation, Hitachi Industrial Equipment Systems Co., Ltd, Lexmark International Inc., Domino Printing Sciences plc, Inkjet, Inc., Markem-Imaje Corporation, and Videojet Technologies, Inc.